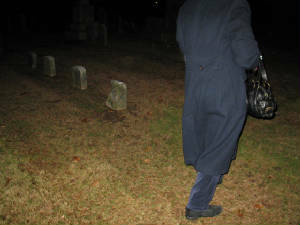 A year has gone by since our original investigation took place in the Farmington town cemeteries in November of 2008. Due to the findings and evidence we got one year ago, we decided to go back and take another look at these two historical cemeteries. However this time I decided to try a daytime investigation along with one night, to see if we could pick-up on any small details that we might have missed the first time around. Now even though a year has gone by, looking at these places a second time, we were still able to uncover even more interesting facts and evidence than before. Most people in the paranormal community know about Riverside Cemetery and it legend that it is haunted. The fact that it was once a burial ground for the Tunxis even before it was a burial ground for the European settlers. When we went there for a second time, our conclusion was that this still may be so, and I’m starting to believe that the legend of Riverside being haunted by children. I must admit I don’t have any solid evidence that the area is haunted by children, but this belief is based on a number of reasons. The first one being from the EVP clip we captured one year ago, when we heard what sounded like a child say “I Don’t Know” the voice seems very clear and distinct, I don’t feel like this was an adult voice, and playing the clip to various people, most would agree, this was a child of some sort. Second, on our recent investigation on November 27, 2009 the paranormal activity we experienced seemed to give us the gut feeling that what were encountering were children. November 27, 2009 at around 9:30PM. Upon entering the cemetery our first priority was to now try to capture picture evidence of ghosts, now that we already had a very good EVP clip from last year. After about 5 min's after entry, I could swear that I hear a voice out of the blue of a child’s voice saying “Oh, look who’s back” unfortunately I was now able to capture this on to audio due to technical problems at the time. However we were able to get some interesting photographs at this visit. During this trip to Riverside Cemetery one of the people on our team repeatedly kept telling me that she felt as if someone was following her, and that she kept hearing the voice of a child speaking as if to get her attention. After I was aware of this we decided to take a picture of her and what came out on one picture was really interesting. I’ve never been a huge believe in Orbs or Orb related photos. These picture abnormalities can be anything from dust to water droplets. But the coincidence couldn’t be ignored that one just happens to be behind the person who was saying this, drifting at the height in which a child might stand. Other than a few other unexplained orb photos and a couple of sound abnormalities that couldn’t be determined on audio, the short visit to Riverside Cemetery was pretty much uneventful. After about 20 min’s of exploring we decided to make our way over to nearby Memento Mori Cemetery. Once arriving to MMC we decided it would be best just to stand right outside the gate of the cemetery, fearing that the police would not find it amusing that we were in an ancient cemetery at night without permission. We stood outside the fence and gate and took pictures and audio as usual. I would reach the recorder over the fence and repeatedly asked questions in order to try to catch an EVP on recorder. This I had found did not work that well, we did not capture any EVP’s at this time. However we did get something interesting in a photograph. 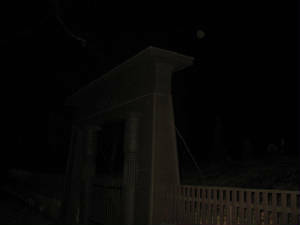 When taking pictures of the gate to MMC we noticed in one picture that there was an orb. Again this didn’t seem like much to us at first. 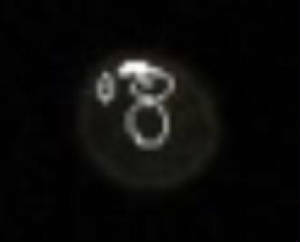 But upon further examination of the photo we just happen to notice that this orb, when magnified seemed to almost have what looked like a face in it. This could all be a big coincidence as well, but it makes for an interesting story to tell. Whether or not you believe this is a ghost is up to you. Before you decide anything I should tell you that there was no full moon was out if that’s the first thought that comes to mind. A ghost or just a reflection of light? Who knows. When we were getting ready to conclude our investigation for the night, I just happened to notice that one of the houses next to MMC was in real bad shape. In the dark at first glance I could not tell exactly what was wrong with it, other that it was in bad condition. It was then I decided that maybe I should take a trip down here during the day, just to find out what happened to the house. Also it would give me a good opportunity to look inside the cemetery during the day when exploring inside was legal. A little over a week later on Monday December 7, 2009 I decided to make a trip up to this area by myself to see what was going on with the house next door of MMC. Upon a close look at the house which was labeled as 123 Main Street, I saw that the house looked like it was just recently abandoned. Children’s toys were still in the backyard, along with a barbeque grill and some other backyard items. The roof of the house was total charred, like the house had caught fire and it looks as if the house was totally unsalvageable. Later research revealed that the house actually did catch fire on Saturday July 11, 2009 sometime after midnight. This would mean that the house caught fire just midway between our November 2008 & November 2009 investigations. This alone gave me a strange feeling because it almost seemed as if the house may have something to do with the haunting at MMC, or maybe that they were connected in some way. But at any rate, it doesn’t look as if the house could be saved. So my guess is that the current owners or insurance company will probably decide to tear it down a build a new one. That would mean the end of this 125 year old house. Its age is known from its marking on the front of the house marked 1885. When I finished making note of the house I decided to take it on myself to do a quick investigation again of MMC. One thing I learned from this experience, never try to do an investigation on your own. I’ve been told this before by other paranormal investigators, but of course I decided to do it anyway. I thought to myself, why not, it’s the middle of the day. What could happen? The mailman was delivering on the street at the time, and there was the noise of construction going on down at another house on the street. I wanted to see what kind of evidence I could get here during the day. So I went in, took some pictures and decided to ask some questions while recording on my tape recorder. For the first 10-15 min’s everything seemed to be fine, I felt good and interested, and didn’t think much of it. 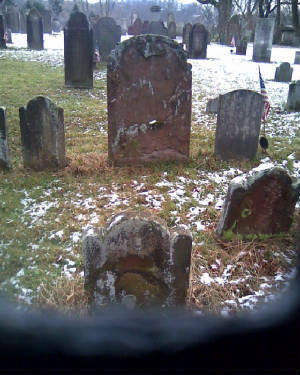 This was until I decided to put my digital recorder on top of a grave monument located in the center of the graveyard. I then said “Do you not like my recorder placed here, remember speak as loud as you can into this” Several seconds go by and then you hear what could be my most chilling EVP yet. A voice was captured speaking into the recorder saying some words that I still can’t make out and then a voice saying the words “UNHAPPY” I did not hear this voice at the time it was recorded, but for some strange reason I was overcome with feelings of great anxiety. I felt right then and there that someone or something didn’t want me there, and I felt the need to really get out of there as fast as I could, and believe me, I did. I left, and haven’t been back since. I don’t think I’ve been as scared on any investigation as I was there…. So I would have to say, with an open mind, after a few field investigations, despite what others in the paranormal community might say... Not only is Riverside Haunted, but Memento Mori probably is as well. I invite others to tell me there stories. So if you have anything on either places, let me know. 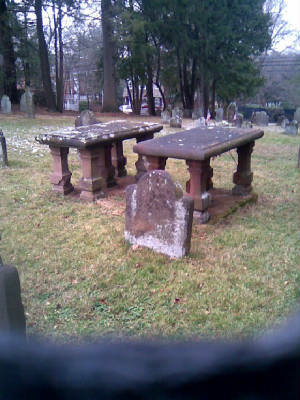 Above are the grave monuments that I rested my recorder on and asked the question " Do you not like my recorder here?" and the EVP unhappy was recorded. 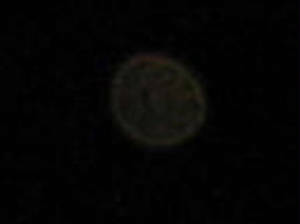 Looking closely you can see an Orb behind her back..
Orginal Picture of Front Gate Picture with orb. This is just me drawing out the face so it can be seen.